If on Sunday morning one had tried to place a bet on the result of the race with a Minardi in fifth, a Jaguar in fourth and a Toyota sixth, the bookmaker would have given odds in the millions. A dollar invested might have reaped a huge crop of cash. But there were not many folk in Albert Park who were interested in a flutter on Mark Webber. The smart money was riding on Michael Schumacher ” which did not take a lot of imagination to spot. You might also have got some short odds on the possibility of an accident at the first corner. The first race of the year always sees a little more hurly-burly and the start at Melbourne was a dramatic one with Ralf Schumacher vaulting over Rubens Barrichello's Ferrari at the first corner. It was a big one but Ralf emerged unhurt. Ralf had made the best start from third on the grid. He passed his brother Michael and was looking for a way to take the lead from Barrichello when things went wrong. Rubens weaved one way and then went the other way. Ralf went back for another try and as they arrived at the braking area he seemed to brake too late. Perhaps he was glancing sideways to see what his brother was up to. Whatever the case, the result was that Ralf went into Barrichello's car and took off. Ralf later said that Barrichello had braked early but Rubens did not agree. "I don't think I did it too early," he said. "In fact I think it was quite the opposite. I braked later than usual because I was worried that something like this might happen. I don't think he would have got round the corner." 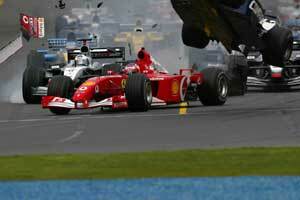 Schumacher said that he had no real complaints about where Barrichello braked. "I cannot complain about the braking," Ralf said. "We were going into the first corner but he definitely changed direction twice and we are only allowed to do it once. I felt like a passenger on an airplane." It was a frightening accident but the safety at Albert Park is impressive and Ralf came to a stop without hurting himself ” which was good news given the problems which resulted from the accident last year. But behind Ralf's Flying Circus there was a considerable mayhem as Michael Schumacher and Kimi Raikkonen both went off onto the grass. Fisichella tangled with the two Saubers and all three men went out on the spot and into the carnage piled Button, Panis and McNish. Villeneuve and Salo made it through the wreckage unscathed. It is not really clear who hit who but Raikkonen went off onto the grass and damaged the underside of his McLaren. That left Webber, Irvine, de la Rosa, Yoong and Sato to thread their way through the mess. It was obviously a case for the Safety Car and as the cars lined up behind it the order was Coulthard, Trulli, Montoya, Schumacher, Irvine, de la Rosa, Sato, Webber, Yoong and Villeneuve. The Safety Car would stay out until the start of lap 6 by which time Frentzen had appeared from the pits in his Arrows. The problem was that he drove through a red light at the end of the pitlane and so was blackflagged a few laps later. To complete the misery in the Arrows pit Bernoldi was later sent out in the spare car ” which was illegal ” and so he too ended the day with a black flag. Tom Walkinshaw's face suggested that this was perhaps not the magnificent event for which he had hoped. In fact, as weekends go, this was a bummer. But while one Scotsman suffered another had a good time. Coulthard took off at the restart and was soon away on his own. On the run down to the first corner Montoya tried to challenge Trulli for second place. He slid wide at the first corner and that gave Schumacher the chance to pass the Colombian. And that meant that Schumacher was up to third and on Trulli's tail but Jarno was obviously not on the pace of Michael. He was ahead and he tried to hold the Ferrari back but it was clear that this was going to be a finite affair. It lasted only three laps and then Trulli spun off into a wall. The Italian thought there might have been oil on the circuit. It was hard to tell but the accident was a bit strange. The crash left the Renault in a dangerous position and so out went the Safety Car again. Coulthard lost his lead of seven and a half seconds. The field (or what was left of it) trailed around until the end of lap 11 when everyone got ready to go again. At the second to last corner Coulthard went off the road. "My car developed a gearbox selection problem and put itself into neutral and that caught me out," he said. Michael Schumacher was in the lead but Montoya had no desire for that to remain the situation and he wound up the BMW engine and went past the Ferrari on the main straight, driving around the outside of Michael to take the lead. It was a nice move. Schumacher held on and the two men diced for the next five laps. "It was an interesting fight with Juan," Michael said later. "It was a straight battle with two pretty equal cars." It looked like the BMW Williams had the Ferrari contained but Montoya knew that this was not the real story. "I quickly realized that I was holding him up as he had more speed than me and it was only a matter of time before I lost the lead." In the end Juan Pablo hit some oil on lap 17 and went wide in Turn One. In a flash Schumacher was ahead and from then on it was like the FA18s which had been flying around before the race began. Michael lit up the afterburner of the Ferrari (figuratively-speaking) and off he went. The gap went out at an embarrassing rate of knots . At the end of lap 17 it was 2.2s, a lap later it was 4.7s then 6.2s, 7.9s, 9.2s, 11.3s and so on... Montoya could do nothing. And that suggested that this was really a tire race because the Bridgestone rubber was obviously rather better than the Michelin. It took a dozen laps before Montoya was able to begin to respond but by then it was too late. Schumacher was gone up the road. Montoya was left to dice with Raikkonen who had come up through the field after stopping for repairs during the first Safety Car. Coulthard's gearbox problem gradually deteriorated and he was off the road now and then as the gears came and went. In the end he was stuck in sixth and he had to park it. Raikkonen knew that his chance to beat Montoya would come with the pit stops and when Juan Pablo pitted on lap 37 Kimi set the fastest lap of the race. He then pitted on lap 38 and came out ahead of Montoya but as he tried to stay ahead of the Colombian at the first corner he went wide and Montoya was back in front again and that was basically it. Fourth place belonged to Irvine from lap 23 onwards when he overtook the ailing Coulthard. It was not what the Jaguar driver had expected would happen but sometimes it is best to take your luck when it comes. "We were certainly very lucky today," Irvine said, "but we finished and others didn't. I had to be careful because the car was not handling very well at all." Irvine did a good job but poor old Pedro de la Rosa was not as fortunate. He climbed to sixth but then had an engine problem which dropped him back and a longish stop was needed. He rejoined at the back and eventually ended up eighth, five laps down. And so to the story of the day: Mark Webber in his Minardi. Eighth at the end of the first lap the Australian debutant was pushed back to 10th as others recovered from the early delay. But then when others ran into trouble he moved up again. On lap 18 he was in the top six. On lap 25 he overtook Coulthard to take fifth. It was all looking great until his pit stop when there was a problem with the refuelling flap refusing to open. The clock on the stop ticked agonizingly onward until he had lost 25 seconds in relation to his rivals. In fact there was so little opposition left that he did not lose his position. However the missing time meant that in the closing laps he came under attack from Mika Salo's Toyota. The Finn pitted after the first lap crash and was stuck in the pits for more than three minutes while a rear track rod was changed. He then drove hard to catch up but would never have caught Webber if the Minardi had not had the refuelling problem. Mika caught Mark with a couple of laps to go ” amid much excitement in the grandstands ” but an attempt to pass Webber got him onto a dusty part of the circuit and he spun away his hopes. The grandstands jumped 10 feet in the air as a result. And if they had held an election at the end of the next lap Webber would now be Prime Minister of Australia with Paul Stoddart as the Governor-General. Alex Yoong might have been in the points as well (he was for a period) but the Malaysian had troubles with his brakes and so faded back to seventh. Seventh place can be worth millions of dollars in F1 these days so Yoong's efforts were much appreciated by Minardi and when all is said and done, no-one could have asked for more. Salo finished sixth which was a great effort for the new Toyota team on its debut. We will have to see how things go as the season develops but there is no doubt that the team has potential. The danger now is that a good finish will raise expectations too much in Japan. Of the rest there was little to say. Sauber's hopes of a big result ended at the first corner. Jordan lost Fisichella in the same accident and Sato soon afterwards with an electrical problem. BAR had a miserable time with Panis punted and Villeneuve running sixth (behind Webber) when his rear wing fell off. Worse still was Arrows. The two cars refused to fire up and so had to be pushed into the pitlane. Frentzen finally appeared from the pits, drove through a red light at the end of the pitlane and so was blackflagged a few laps later. Bernoldi was later sent out in the spare car ” which was illegal ” and so he too ended the day with a black flag.